Turkey has begun building a major dam, despite criticism that the project will ruin an ancient archaeological site and displace thousands of people. Prime Minister Recep Tayyip Erdogan led a ceremony to begin work on the Ilisu dam in the south-eastern Turkey. Turkey says the $1.55bn (£800m) project will help irrigate vast areas of farmland and provide vital energy. 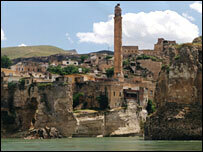 Critics argue that it will destroy ruins and artefacts at the Hasankeyf site dating back thousands of years. Some 4,000 protesters held an overnight vigil near the dam site on the River Tigris, about 45km (28 miles) north of the Syrian border. "The step that we are taking today demonstrates that the south-east is no longer neglected," Mr Erdogan said during the ground-breaking ceremony. "This dam will bring big gains to the local people," he said. Ankara hopes that the dam - part of a long-term plan to develop the poor, mainly Kurdish region - will create up to 10,000 jobs, irrigate farmlands and attract tourists. The government has promised to compensate local people who will lose their homes and that all the valuable artefacts will be relocated before the dam's completion in 2013. 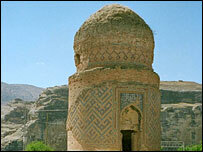 But opponents say the most important items - including a 12th century palace in the city of Hasankeyf, mosques and cave dwellings - will be destroyed. They are now taking their case to the European Court of Human Rights. In 2001, Britain's engineering company Balfour Beatty pulled out of the project, citing "environmental, commercial and social complexities". Italian building firm Impregilo and Switzerland's largest bank, UBS, have also withdrawn from the project. The area where the dam is being built has seen more than a decade of fighting between the Turkish army and Kurdish rebels that left some 37,000 people dead.